In the Oku-tama 奥多摩 region, Mt Mitake 御岳山 is a sacred mountain. You can catch a cable car up most of the way, and at the top is Musashi Mitake Shrine 武蔵御岳神社 and treasure house. 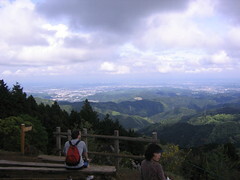 From Mt Mitake 御岳山 it’s an easy hike to Mt Hinode 日の出山, which offers views of the Tokyo skyline. From Mt Hinode 日の出山, its downhill to the station. An easy hike, suitable for families if you just want to do the Mt Mitake 御岳山 section of the hike, and with many shops and restaurants around Mt Mitake 御岳山 (but not further on). There are many different and interesting hikes in this area, so I recommend you buy a map. The Mapple 山と高原地図 series number 23 map is of the Okutama region, and is available on Amazon.co.jp. Note, this map is in Japanese, but does include some English and furigana. From Mitake Station 御嶽駅 head out the only exit and turn right. Not far down the road on the opposite side is a bus stop. From here you can catch a Nishi Tokyo Bus 西東京バス to Cable Shita ケーブル下, the Takimoto Station 滝本駅 of the Mitake Tozan Railway 御岳登山鉄道. Head up the road from the Cable Shita ケーブル下 bus stop, and you’ll see the cable car station on the right. If you want to hike all the way up, just continue following the road. To the top cable car station by foot should take about an hour. At the top cable car station is a few shops and an area to sit and have a rest. To start walking towards the summit of Mt Mitake 御岳山, take the path to the left, also known as Main Street. 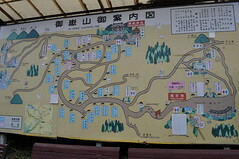 Just before Main Street is a map showing you the route to the shrine. Following the path along, after a short while you will enter a village. Keep following the main path upwards between houses, shops and hotels, and you should get to the steps leading to Musashi Mitake shrine 武蔵御岳神社 within 20 minutes. A quick trip up the stairs to the shrine will have you at the summit of Mt Mitake 御岳山. The shrine itself was a place of worship popular with Samurai, so just down from the main building is a treasury building holding a couple of lovely examples of armor (entry 300yen). Please also note, the toilets around the shrine and village are the last until just before the end of the trail. 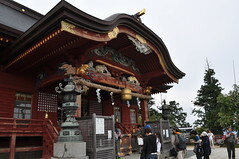 To hike to Mt Hinode 日の出山, walk back down the stairs, and past the shops in front of the shrine. Instead of turning back the way you came, take a right turn and follow the path through the village. It can be a little confusing walking through the village, so keep an eye out for signs pointing to Mt Hinode 日の出山. Once you pass the village you’ll be walking along a ridge line for about an hour. Along this ridge are a few alternatives, but if you keep to the left and head up hill you will arrive at the summit of Mt Hinode 日の出山. There are great views from Mt Hinode 日の出山, looking back towards Mt Mitake 御岳山 and the Tokyo skyline. There is also another rest stop and tables for picnic lunches (but no shops). When you want to continue on, descend down the other side of the summit. Once again there are alternative paths, but initially stick to the left and follow the signs that point to Hinatawada 日向和田. Walking down through the cedar you will pass a road, and eventually a small shrine full of Maneki Cats (lucky cats). From this point the path will become a little steeper, zig-zagging back and forth, with tall steps. Towards the end of the hike you will walk alongside a golf course. It takes about 2 hours to reach here from Mt Hinode 日の出山. Where the trail joins the road is a portable toilet. Keep following the road until you reach the traffic lights. You’ll have passed a Plum tree park on the right along the way. At the lights turn left, and then at the next set of traffic lights turn right. You can follow this road along, across a bridge, until you reach the train lines. Hinatawada Station 日向和田駅 is just a little down the road on the right. As always, the following routes are just recommendations. Please use Hyperdia or Jorudan’s Train Route Finder to find the most suitable route for you! From Shinjuku 新宿, catch the JR Chuo line 中央線 to Tachikawa 立川 and change to the JR Ome line 青梅線 towards Okutama 奥多摩. It should take about 90 minutes and costs 890yen, but you might need to change trains at Ome Station 青梅駅 to go further on to Mitake Station 御嶽駅. Trains run regularly on these lines. From Mitake Station 御嶽駅 catch the Nishi Tokyo Bus 西東京バス to Cable Shita ケーブル下 bus stop. Buses leave at least once or twice an hour from Mitake Station 御嶽駅 and cost 270yen for the 10 minute ride. The Mitake Tozan Railway 御岳登山鉄道 cable car leaves at least once every half hour and costs 570yen. From Hinatawada Station 日向和田駅, catch the JR Ome line 青梅線 to Tachikawa 立川 (again you might need to change at Ome Station 青梅駅), and then the JR Chuo line 中央線 to Shinjuku 新宿. This should take about 75 minutes and costs 780yen. Found this page on Google as I’m planning to go hiking around Mt. Mitake tomorrow. Thanks for the really detailed write-up, including the useful Kanji as well! Likewise, was looking for a hike tomorrow, and greatly appreciate teh kanji assist!! thanks for posting this! What a wonderful hike this was! Haze obscured the long distance views, but it was terrific none the less. Your directions helped out immensely, especially with the Japanese next to the English place names. I got a little confused at the four way intersection, after the big microwave tower. So I hooked a right to the Hinode Mitsuzawa Tsuru-tsuru Onsen (it was getting late, anyway), then caught the bus there to Mushashi Itsukaichi station. I’m really happy you enjoyed the hike! This is one of my favourites because its pretty easy and accessible. When you want to continue on, descend down the other side of the summit. Once again there are alternative paths, but initially stick to the left and follow the signs that point to Hinatawada 日向和田. Walking down through the cedar after about 2km you will pass a microwave antenna tower on the left and the trail leads onto a paved road. The road goes downhill to a four way road intersection. The trail continues into the woods directly across the intersection and eventually leads to a small shrine full of Maneki Cats (lucky cats). Also, I think the signs on Mt. Hinode indicated Yoshino Baigo (Plum Park), rather than Hinotawada, but I don’t have the Japanese spelling of that. Thanks again for all the hike tips. I am back to the U.S. in a few days, but will use your site again when I return. Best of luck when you return home to Oz next year. Thank you so much Vin, for the suggestion on the Mitake/Hinode hike! (and sorry for the slow reply!) I’ll be giving a lot of my site a re-vamp over the next 6 months, so when I re-write this entry I’ll give you credit for help! Once again, thank you!! !